Visions for the museum include now-standard touchscreen displays. You've heard that the ambitious new museum coming to town, the one with an emphasis on storytelling and a national reach, has just secured its high-profile downtown location, right? If the great white Star Wars splat on the lakefront comes to mind, you wouldn't be wrong. The Lucas Museum of Narrative Art got the City Council's rubber stamp of approval last week for its $10, 99-year, 17-acre parkland lease. It now has only a pesky lawsuit by Friends of the Parks to contend with before it breaks ground next spring. But what we're talking about here is not the already famous LMNA, but the slightly less glamorous AWM. As in American Writers Museum. The American Writers Museum announced last week that it has leased an 11,000-square-foot space in a vintage building at 180 N. Michigan, and plans to open the only museum in the world dedicated to American writers there in 2017. Museum officials, making the announcement at the Cultural Center, said that after five years of planning they chose to locate in Chicago because of its geographically and historically central role in the development of American literature (take that, New York). And they chose this North Michigan Avenue building because of the tens of thousands of pedestrians—many of them tourists—streaming past it every day. The space is on the second floor, which could strike some as a challenge. But officials expect it to draw 120,000 visitors annually—about the number who make it to Pilsen's National Museum of Mexican Art or the Illinois Holocaust Museum in Skokie. And they expect visitors to pay an admission fee of $12 ($10 for seniors; $5 for students). They didn't compare it to another fee-charging museum close by, the Museum of Broadcast Communications, at 360 N. State, which struggled to attract a grand total of 7,300 visitors last year. The National Museum of Mexican Art, which displays actual artwork and has a solid constituency among Chicago residents, is free; the Illinois Holocaust Museum, which also has a cultural constituency, does charge an admission fee, but doesn't collect the full amount from all of the school groups that make up 60 percent of its visitors. Maybe that'll be the situation for the Writers Museum as well, but its budget projects 100,000 visitors paying an average of $10 each in its first year. This museum was dreamed up by founder and president Malcolm E. O'Hagan, an east-coast engineer and book lover inspired by visits to the Dublin Writers Museum in his native Ireland. Its mission is to "engage the public in celebrating American writers and exploring their influence on our history, our identity, our culture and our daily lives." It's landed two grants from the National Endowment for the Humanities, and is affiliated with 51 author-home museums across the country. Its advisory council includes the likes of former poet laureate Billy Collins and author Scott Turow, and it has collected enthusiastic blurbs for the project written by everybody from former NEA chair Dana Gioia to author Dave Eggers. But what, exactly, will it consist of? Permanent exhibits that feature American writers, dead and alive; galleries showcasing items on loan from the affiliate author homes; and "educational programs and special events." Andrew Anway, of Boston-based exhibition design firm Amaze Design, was on hand to talk through renderings of a half-dozen galleries (including one devoted to "Chicago: City of Writers") that look to be fairly standard-order push-button displays, heavy on biographical information, snippets of text, photos, and video. There'll be, for example, a multiuser touch-screen table loaded with "deep, relevant, and interrelated information"; an interactive national map; and an opportunity to search for an author who shares your work habits or favorite color. 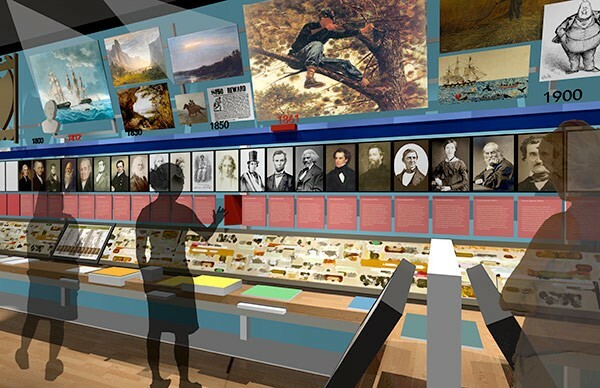 Asked why folks on Michigan Avenue would seek out the museum's second-story space and pay to enter it when much of the information it'll present is a tap away on their laptops or phones—or available at the, you know, public library—Anway said the museum will provide "context." His firm designed the "Sensing Chicago" exhibit at the Chicago History Museum, where kids can get a sniff of the stockyards or jump into a giant hot dog bun and pile on squishy-pillow pickles and peppers. Executive director Nike Whitcomb anticipates an operating budget of $1 million annually once the museum opens. She says they've raised $3.2 million so far and are looking for a total of $6 million by the close of 2016, with a "grander vision" for the long run. Three years ago, O'Hagan told an interviewer that the museum will rent until it's able to move into its own building, "hopefully on the lake." Nobody mentioned that last week. The public had its two minutes. Now the Chicago Park District can get back to business. The Lucas Museum releases, uh, revised renderings of its proposed Chicago lakefront building. Has the Museum of Broadcast Communications finally found its frequency? Visitors are scarce and the vast archives aren't digitized, but founder Bruce DuMont hopes a new exhibit will help get people tuned in.